Posted by Glenn Irvine in Blog, Commentary, Competitive, Media. Ray Ozzie was reported in the IDG News Service late last week, in one of his rare outings with the Media on his views of Cloud Computing and the appetite for it by the Enterprise Sector. In essence he believes that the first wave of adoption by Corporates will be the transition of Email and Collaboration technologies to this mode of operation, and this makes perfect sence. The competition is clearly eyeing both of these solution spaces with offerings from IBM’s Lotus with Lotus Live – Email, and Lotus Live – Engage; as well as Google with GMail and Google Apps. Talk to any one of these vendors and they will have their complete “Cloud Ready” spiel at hand, and all of their offerings have their marketing engines winding up well beyond the “Beta” messaging often being used. Have a look at the article with Ozzie’s comments on ComputerWorld here. I noticed an article today on NetworkWorld where the COO of Microsoft, Kevin Turner stated to a Financial Analysts Annual Meeting, that they would be targeting 5 Million Seats of Lotus Notes Customers this next year. It looks like the competitive scene between IBM and Microsoft is heating up again with both Vendors claiming Marketshare gains last year. And I know both have competitive campaigns and programs focusing on this core area of the market. It’s going to be an interesting ride in some key Australian Accounts over the next 6 months as they both struggle for mind-share and influence. 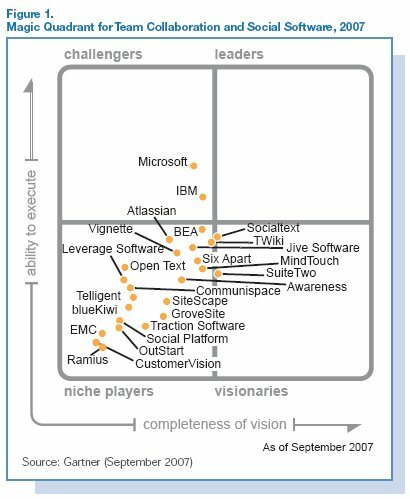 The proliferation of Sharepoint is also an interesting dynamic as this article from some Forrester research highlights it is essentially this decade’s Excel & Access, and IT departments will struggle to meet user demand for support, as the creation by users of sharepoint instances grows. A careful read will highlight where Lotus needs to focus going forward to remain competitive. Hosted models, SaaS, Social and Cloud Computing are all to be seriously considered in my opinion. Will Ozzie era at Microsoft signal a revolution? To understand the threat and why the golden slipper isn’t on Microsoft’s foot this time, one only need to know that industry experts predict that by May 2009 Google’s search business alone (not including AdSense) will be larger and more profitable than Microsoft’s most famous cash cow — Windows. The services effort is the biggest test of Ozzie’s storied career. With Gates leaving his full-time post July 1, the new chief software architect, at Microsoft since 2005, is officially on the clock as it ticks into the future. His task is to meld Microsoft’s packaged-software pedigree with both consumer and corporate services, what the company calls “software plus services” and battle Google and other Web and Enterprise 2.0 companies. Ozzie, a noted technologist like Gates, has established a framework for Microsoft’s services architecture; presided over the rollout of a mish-mash of consumer and enterprise services; and is spearheading the development of perhaps his most important effort to date — Live Mesh, an online data-sharing and synchronization service introduced in April. It will likely compete with Apple’s newly unveiled MobileMe and start-up services such as SugarSync and Joggle. Microsoft must also overhaul the nontechnical side where makeovers will be needed for its corporate culture, business model, and partner and customer relationships to accommodate a services model that includes lightning-fast development, new distribution strategies and superior customer service. It’s all in its infancy, and has already suffered a hit with the failed bid to acquire Yahoo, a move designed to accelerate Microsoft’s online and advertising strategy. Ozzie, however, has already dissected the challenge and is laying out his plan for a services framework that he hopes to have in place by the end of 2008. He has highlighted the importance of advertising to help fund the online effort, including Microsoft’s US$6 billion acquisition of digital marketing vendor aQuantive late last year. To underscore the task at hand, Microsoft CEO Steve Ballmer said last year that eventually 25 per cent of company revenue will come from Internet advertising; in fiscal 2007 the total was just more than 3.5 per cent. Improving those numbers could prove difficult. “If you are able to win market share, eventually the profits have followed, but Microsoft has not shown that it knows how to make money on the Internet,” says Thomas Haigh, a historian of computing at the University of Wisconsin. To help grow its advertising revenue numbers, Microsoft is investing in search, user retention, technology, operations, sales and communication services. Ozzie’s services plan centers on three principals: using the Web as a hub, offering choice between on-premises software and hosted services, and providing a “fragmented” programming model that is defined by small components wired together on the fly. His services framework has four layers: an infrastructure layer that is the physical platform to host and run services; a common services layer for such tools as the adCenter advertising platform, identity, synchronized storage and connectivity; a developer layer that includes protocols and APIs and the all-important Mesh Operating Environment that runs on the client and online; and the application layer that includes Live Mesh, Microsoft services such as hosted Exchange and SharePoint unveiled in April, and third-party services.Ozzie also said in April virtualization will be critical for hosting services, especially consolidation of workloads to maximize CPU utilization and for isolating resources per customer. The company last year began showing peeks at a minimalistic version of the Windows kernel called MinWin that is in the early development stages and may be the apple of Ozzie’s eye. Microsoft currently has Windows Embedded CE and just this week announced that it has released the NavReady 2009 version optimized for portable navigation devices. The embedded operating system includes hooks to Microsoft Live Search. The next big services unveiling will come in October at Microsoft’s annual Professional Developers Conference, where Live Mesh will get a beta upgrade and be distributed to more testers along with an early preview version of Microsoft’s Oslo modeling technology. The conference sessions will walk developers through building service-based applications and hooking into the Microsoft services framework. “You can imagine the huge challenges in moving from a product-focused business model and sales culture, and you can imagine the huge philosophical, cultural and business model challenges they need to look at,” says Ken Thoreson, president of Acumen Management, which provides sales management consulting. Thoreson says Microsoft’s track record with executing the delivery and integration of new products into their existing model is spotty. “The question is how fast will they come out of the chute. Normally, they struggle with that,” he says. Microsoft will have to deliver a top-notch support model for services customers and will eventually have to redefine its relationship with partners in terms of services. Help crafting solutions to all these issues will come from the top. It is important in many ways because Microsoft has so much at stake, so much ground to make up and so much to prove for the first time without Gates at the helm. Despite the monster it has been over the past two decades, the future may hold a more humble place for Microsoft if Ozzie, Ballmer and crew sans Gates can’t execute on the services plan.